Home > Blog > First stop, grocery shopping! Where can I do a grocery shop, right after I’ve picked up my motorhome? When it comes to grocery shopping, there are lots of choices within ten minutes of our depot. From medium-sized supermarkets to mammoth hypermarkets (that sell everything from inflatable swimming pools to washing machines and every imaginable foodstuff), we have all the choices. 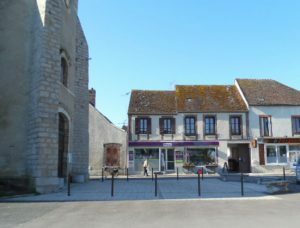 However, for a much more manageable shopping experience, we also have a very well-stocked grocery shop right here in Véron village. 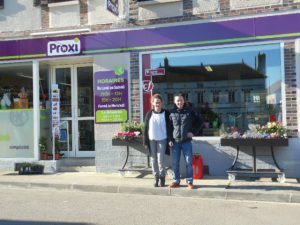 The Proxi Marché, situated about 500 metres from our depot, in the shadow the village church, is run by charming local couple Émilie and Cédric. They stock everything from local wines to fresh produce and take great care when selecting what they sell. We think they do a better job than the supermarkets when it comes to choosing fruit and vegetables, and often have local produce that was picked that very day. Easy grocery store parking, even for the first-time motorhome driver! 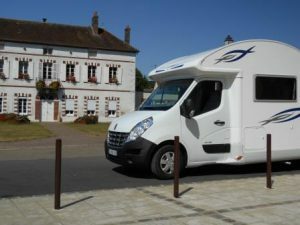 We hope you agree that village shops (especially good ones) should be supported by everyone, so for an easy and convenient way to stock up on supplies for your first evening or couple of days, head to the Proxi Marché after you collect your motorhome. The store’s opening hours are Monday-Friday 7h30-13h and 15h-20h; closed Wednesdays; and Sunday 8h-13h and 15h-20h. Émilie et Cédric extend a warm welcome to locals and visitors alike and are always on hand to help you find what you need.